Senator Alex Padilla with Danielle Lewis, Lizzie Yasser, and Ryan Andrews during the California Fit Business Awards ceremony. 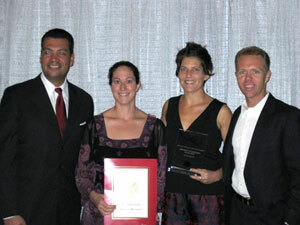 UCSC's worksite wellness program recently received a 2009 California Fit Business Award, given by the California Task Force on Youth and Workplace Wellness for promoting employee health and a healthier workplace. UCSC received a silver-level award for programs and services in four key areas: eating better, moving more, promoting healthy lifestyles, and creating a healthy culture. Recognizing the value of a fit and healthy workplace to organizations and workers alike, the California Task Force on Youth and Workplace Wellness honored 71 employers. Each award winner received a trophy and certificate of recognition from State Senator Alex Padilla during a ceremony in Sacramento on November 5. Accepting the award on behalf of UCSC were Ryan Andrews, executive director of OPERS; Danielle Lewis, Wellness Center director; and Lizzie Yasser, employee wellness coordinator. UCSC's employee wellness program began in February 2008 and is funded by the UCOP initiative Be Smart About Safety. By emphasizing "wellness anywhere," the employee wellness program provides enjoyable opportunities for faculty and staff to practice healthy behaviors and adopt healthy lifelong practices, allowing them to reap the benefits both at work and at home. For example, the "Slugs on a Stroll" One Million Steps Challenge, a walking program held over the summer, invited participants to accumulate and track one million steps over the course of four months. Each participant received a free pedometer and bi-monthly emails containing walking tips and encouragement. For every 250,000 steps walked, each "strolling slug" could pick up one of the incentive prizes, which included UCSC Wellness socks, hats, and stainless steel water bottles. Although the challenge wrapped up in September, employees still can request a pedometer by contacting Lizzie Yasser. Since May, more than 750 staff, faculty, and retirees have joined the Slugs on a Stroll walking club. During the course of the challenge, the UCSC community tracked more than 215 million steps, equivalent to 107,000 miles, or four times around the world. The California Task Force on Youth and Workplace Wellness was launched by the state Legislature in 2002 to address the critical issues related to physical fitness and nutritional health in California's schools and workplaces. The Fit Business Awards are a coordinated effort between the California Task Force on Youth and Workplace Wellness and the California Department of Health Services. The annual awards program was first launched in 2003, seeking to recognize private, public, and nonprofit business models across California that promote a healthier workplace. For more information about employee wellness classes, programs, and resources, please visit the new UCSC Wellness web site or contact Lizzie Yasser at (831) 502-7375.